After our Blue Mountain trip we spent a day exploring Gosford and the waterfront, complete with pelicans that sit on the lampposts! We discovered St Mary’s Church, a modern “in the round” building next to the original small church which is now used as a wedding venue. 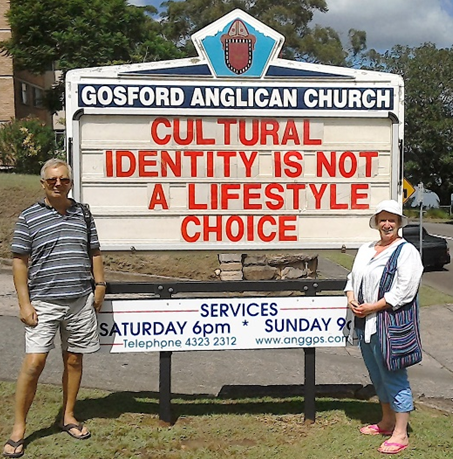 St Mary’s is the home of Fr Rod Bower, author of the, sometimes controversial, signs outside the church that have become famous worldwide. The sign at the time is below. We met Fr Rod and his wife and shared news of Fr Brett (they trained together in Australia) but left them on high alert as they were awaiting the arrival of the Grand Mufti for a multi-cultural conference, which was being observed by the local police in case of anti-Muslim troubles. We headed for the waterfront and an excellent fish and chip lunch, attended by expectant seagulls. Leaving our bags at the hotel the next morning, we took the train and bus out to Bondi Beach. We have to admit to being a bit disappointed as it wasn’t quite the wild, huge surfing beach we had imagined. For Sydney city dwellers it is a wonderful doorstep facility and the home of TV Lifeguard reality/drama. There was no drama when we were there but they were filming on the beach near the lifeguard station. We walked along the coastal path round a couple of bays to Bronte Beach for lunch, admiring the beaches and rock formations along the way. 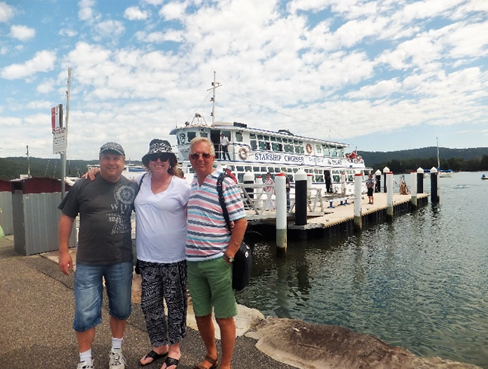 We bussed back to Sydney and used our Opal passes to catch the ferry round the harbour to Watson Bay and back – as good as any organised harbour tour! It was a lovely afternoon and we admired the views, expensive houses and boats. Interestingly, the Costa Delizosa (remember Costa Concordia?) was moored up in the middle of the harbour, well away from the Opera House and Harbour Bridge! Heading back to the station, we collected our bags and mingled with commuters on the journey back to Ourimbah. The following day was a rather domestic affair, highlighted by Martin’s BBQ full English breakfast. We caught up with laundry and shopping and walked the dog along Avoca Beach, dodging the incoming waves. By Wednesday we were ready for the next of Kim’s wonderfully organised trips. This was a trip out of Gosford on Brisbane Water. Our fellow passengers were local pensioners who didn’t seem too bothered by the scenery but had eaten all the cakes by the time we got to the included Morning Tea! With a dolphin to accompany us we headed out towards the sea, passing pelican colonies, fancy hotels and wonderful waterside homes. The dolphin only follows the boat as far as a major road bridge but hangs around and joins you on the return trip. A stop at Woy Woy (home to Spike Milligan at times) for those who wanted fish and chips for lunch meant we were escorted back to Gosford by a large gang of excited seagulls. We were destined for lunch at the Gosford Sailing Club where you can “join” for the day and enjoy their excellent first floor restaurant overlooking the water – and more pelicans. Back at home I was given a lesson in proper Pavlova making ready for the following evening’s supper. In exchange we shopped and prepared Paella the next day when the whole family were gathering for the evening. We also made full use of the swimming pool in the garden, even though the residents seem to think that March is a bit late in the year for such activity. It is solar heated and perfectly acceptable for Poms who grew up swimming in the Solent. 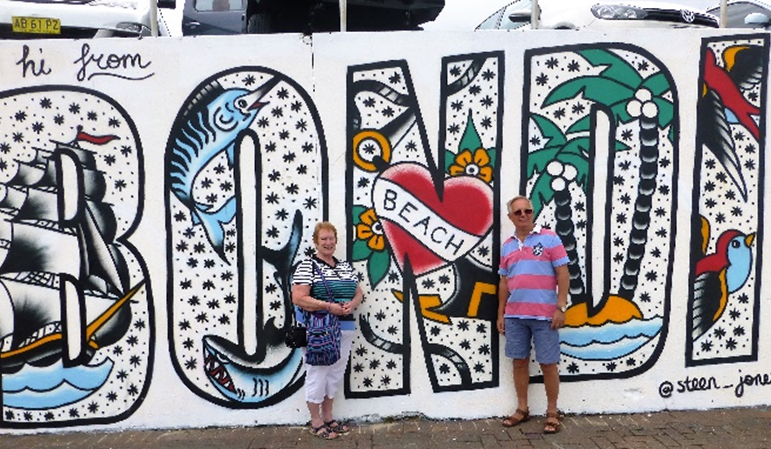 The weather was beginning to look changeable but still warm so we spent an afternoon strolling round the Entrance (even more pelicans) before heading to Avoca to book into “The Second Best Exotic Marigold Hotel”. Sheltered from a thunderstorm, we enjoyed the film in a wonderfully old fashioned cinema where they serve tea and sandwiches in the foyer and there are lovely arty things to buy. All this helps to fund the privately owned cinema which still has red plush seats and old fashioned lighting. The film was pretty good too! 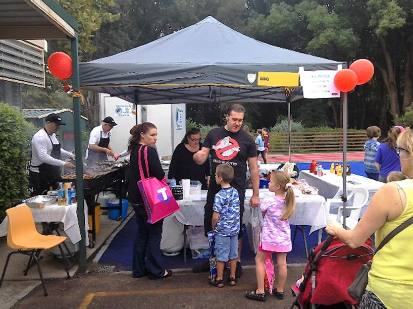 Our last day was spent at the local primary school Fayre (Kim works in the parent run canteen). It was an interesting insight into Australian schools. Much of it was similar to English primary school but much more use is made of the outside areas and shelter is provided to protect children from the sun. Colin definitely had BBQ envy when he saw the set up run by the PTA. In the afternoon we visited Kim’s parents who live in a “property” not far away but out in the bush. They have a lovely bungalow built on the top of a hill, surrounded by forest. Annette’s main gripe is that she has to spend a lot of time picking up sticks before Neville can mow the surrounding lawns on his ride on mower. In exchange they have wonderful views and wildlife (we won’t talk about the snakes). In the evening we had a family meal at a restaurant where you could take your own wine, they didn’t charge corkage (even though they sold alcohol) and even disposed of your empties. What service! The food was pretty good too. Bags were packed and we headed home via Dubai and were warmly welcomed by the family with breakfast at home. It was good to be back with them, especially as there was news of a new grandchild due later in the year. We still have itchy feet and hope to retrace our steps again in the not too distant future.